Vol. I. Portland, Monday, January 27, 1862. No. 347. GREAT SALT LAKE CITY. -- A Frenchman from Salt Lake City, writes -- "The streets of Great Salt Lake City are perpendicular to the course of the Jordan, and cut at right angles by other streets, which run parallel to the river. The whole is surrounded by a mud rampart. Our travellers, who arrived here on the fifty-eighth day of their journey from Sacramento, were conducted to the town hall, and thence to the Union Hotel, kept by the Hon. Mr. Kinney, at that time supreme judge of the territory of Utah. All the streets are about forty yards in width, and were watered by rivulets of clear water, bordered by double rows of cotton-wood. -- Every house has a graden. Hence it is that the city is three miles in circumference. Brigham Young's residence was almost palatial. Thirty sultanas inhabit this harem, which is said to have cost $30,000 to the Mormon pontiff, whose personal fortune is said to exceed $400,000. He himself, however, lives with seventeen select wives in a house close by the palace, the roof of which is surmounted by a bee-hive, emblem of the industry and innocence of the inhabitants, or of the frequent honeymoons by which they celebrate their existence. Next to it are the "tithing" and other offices. Among other public buildings are also a court, a library and a social hall. A vast space is left for the erection of the temple, which is proceeding under the auspices of an English Mormon by the name of Angell. Vol. XII. Portland, Saturday, March 15, 1862. No. 17. France, England and Spain seized the moment of rebellion in the Southern States to make aggressions on Mexico. Out seceeders supposed the two first named governments would also make war upon the United States, while the same rebellion is in pregress, as an opportune moment for breaking up our Union and reducing the influence and power of our country among the nations of the world. But France and England have shown true wisdom in not gratifying the wishes of our successionists. Brigham Young and his gang, [supposing] that our Government would now, under the rebellion pressure, yield up to their wishes, have pursued a policy to drive off the officers of the General Government in Utah Territory, convened a convention, formed a [proclamation], and have given notice that polygamous Utah must be admitted into the Union as an independent State, or that she will remain out of the Union as an independent nation. The new State is to be called "Deseret." The constitution will be voted on by the people on the first Monday of March, on which day is to be held the general election, at which a governor, lieut. governor, representative to Congress, and members of the General Assembly, are to be elected. The first meeting of the General Assembly is to be called by proclamation of the Governor. Doubtless the constitution will be accepted by the people -- as it is sanctioned by Young and his official colleagues. The same convention that formed the constitution unanimously made the following nominations for the consideration of the electors at the first general election under the constitution. For Governor Brigham Young; for Lieutenant Governor, Heber C. Kimball; for Member of Congress, John M. Bernhisel. The manner in which the last Administration played into the hands of the Mormons, and submitted to indignities cast not only upon them but the country, was disgraceful to the nation. Mr. Buchanan sent a large military force to Utah to compel the people there to submit to the Government and to obey its laws. When hundreds of miles from thence, it permitted Mormons to seize and burn their trains and to capture and rob our troops, if not murder them. 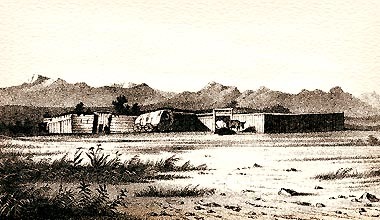 When the forces arrived in Utah, at the seat of Mormon power, indignities were still heaped upon them, and they were kept there in perfect inaction -- not permitted to sustain the officers sent there by Government in their duties -- apparently, merely remaining there for the purpose of spending money for the benefit of the Mormons. Finally, they were ordered to California -- and made the laughing-stock of Brigham and his Saints. The policy of the last Administration -- and the present condition of the country -- doubtless has encouraged the deluded gang to believe that they can force Congress to admit Utah into the Union as an independent State. They would do well to recollect that they are not now to deal with James Buchanan, the thief Floyd, or any of that class of men. Utah will not be admitted as a State with her polygamy; and if she persists in rebellion, she will be severely punished -- and the gangrene of Mormonism, found in Utah, be removed. Vol. VII. Portland, Thursday, February 7, 1867. No. 1. THE MOUNTAIN MEADOWS MASSACRE. -- In the Wasatch Mountains of Utah is a tribe of Indians who call themselves "Mooties," or are called by the whites "Muddies," and from whom the clear and sparkling river, Muddy, derives its name. The Austin REveille has the following in regard to the connection of these Indians with the Mormons in the Mountain Meadows massacre. These Indians were formerly regarded by the dwellers upon the Colorado and travelers between Salt Lake and Los Angeles as warlike, and the most dangerous and troublesome in that section of the country. They have until lately been very friendly to the Mormons, and appeared to be in a great measure under their control. The mutual friendship, however, was only for the purpose of alliance against others, and when the opposite [arty became numerous and strong the Indians transferred their friendship. In this condition there is a prospect of verifying the old adage that "when thieves fall out honest men get their dues." These Indians are now anxious to reveal their knowledge of the crimes committed by their old allies, the Mormons, and in which they had participated. They have, perhaps, lately learned that murder and robbery are considered as crimes, for which punishment is meted, if committed by whites, but probably fancy that Indians are not punishable, such crimes being thought commendable by them. The Mooties reside in that part of the country where the Mountain Meadows are situated, and were witnesses and participants in the terrible massacre there committed by the Mormons a number of years ago. Of that horrid transaction they retain a vivid recollection, and the particulars of it they are anxious to reveal. They report their acquaintance with the leading Mormons who participated, and also that there are now several children yet in Indian captivity who were taken from the murdered emigrants. The fact that there are children yet in captivity should induce the Government to make some exertion for their rescue, and to renew its investigations into the murder of so many men, women and children. We believe that while Cradlebaugh was Judge in Utah the affair was pretty well sifted, and the massacre leaders made known. A vast amount of testimony was taken and several reports made to the stern and upright old Judge, and these are probably stowed away in the archives of sime department at Washington. Perhaps any attempt at punishment during the terms of [con------ing] Pierce of effete Buchanan would have been abortive, but now, instead of such Presidents, an energetic Congress shapes the policy of the Government, and with new evidence offering, we call upon our loyal and determined Congress to renew the effort to rescue the captives of misfortune and to bring to condign punishment the perpetrators of one of the most terrible crimes that has ever disgraced the annals of American civilization. The time is opportune. The Mormons are defiant an oppressive, and yet seek shining lights fir great examples of terror. It is time that an example should be made in return. Their murder of the emigrants, or the assassination of Bloomfield or Robinson, was not for plunder, nor to recover an apostate, nor to avoid a lawsuit, but to strike terror into others, so that the Mormons might rule undisputedly. These will be repeated and other deeds of horror committed, unless the Government speedily intervenes to protect and punish. The Indians of whom we have spoken now mix with the miners and prospectors in the southeastern sections of the State, are friendly and quite intelligent, and are familiar with the deeds of the Mormons. Their testimony or their aid in tracing circumstances may lead to the complete unraveling of that great mystery.